Consumers constantly make trade-offs between fidelity and convenience, weighing the quality of an experience against the ease of getting that experience. We'll give up some fidelity to get more convenience, or vice versa. And the products that most people gravitate to -- the products that make people happiest -- tend to be either the most convenient or offer the highest fidelity. A hundred years ago, that trade-off killed the electric car. And it's going to seriously hobble the Chevy Volt when it hits the market next year. That's because products that fall in the middle no-man's-land -- offering neither outstanding fidelity nor astonishing convenience -- struggle in the marketplace. And the Volt seems to be driving straight into that ditch. To see why, go back to the earliest electric cars. When cocktail-party chatter turns to electric cars, someone always notes that electric cars thrived in the early 1900s -- as if the auto industry randomly gave up on electrics, or outright squashed them. But there was a darn good reason electric cars were popular then. At the time, they were the highest-fidelity personal transportation. The high-convenience option was the horse. And compared to electric cars, gas-powered cars sucked. Electric cars could be easily started; gas cars had to be cranked. Electric cars didn't require changing gears, while changing gears on a gas car felt like arm-wrestling a gorilla. Electric cars were quiet; gas cars were obnoxiously loud. Electricity had spread so there were lots of places to plug in a car; gas stations were almost non-existent. And the only roads good enough for cars were in cities, not between cities. Add it all up, and if you wanted a good driving experience circa 1910, you bought electric. Then lots changed. General Motors invented the self-starting engine -- no more cranking. Transmissions improved. The muffler made engines quiet. As gas cars improved, gas stations appeared to serve them. And then came the kicker: better roads made people want to drive farther. Electric cars could only putter around a city at slow speeds. Gas cars could zoom to the countryside. By 1915, gas cars blew past electric cars in fidelity. Then Henry Ford set up his assembly line and made gas cars that cost 75 percent less than a typical electric. By 1920, low-cost cars became more convenient than electric cars, too. Electric cars fell into the no-man's-land of apathy. They were neither high-fidelity nor high-convenience. So electric cars died. They've stayed dead for nearly 90 years. Interestingly, one electric car since then has generated real excitement -- the Tesla Roadster. Unveiled in 2008, it looks like a classic, super-hot sports car - and drives like no other sports car, ever. Hit the accelerator and the "G" forces literally could push the driver's head back against the headrest. And its electric motor is almost silent. Its base price: $109,000. Most people will never own one. But Tesla broke through by finally making an electric car that could compete with the best gas cars on fidelity. 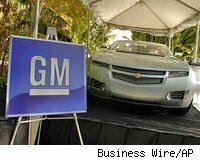 Next, GM will try to sell the Volt. But where does the Volt land on fidelity vs. convenience? It's not a high-fidelity play -- it's no Tesla Roadster. The Volt will go a long way toward solving the electric car's huge convenience problems of refueling and range. The car can travel 40 miles on the electric battery alone; after that, a small gas generator kicks in to re-power the battery as you're driving, allowing the Volt to go another 200 miles or so. Still, at some point you have to plug the thing in for 3 hours, which is not very convenient on long trips -- or if you have to park on the street. And then there's the Volt's price. Right now, it looks like the car will cost $40,000. That's what people spend on a high-fidelity car -- a nice Mercedes or a tricked-out Escalade. If you're going to buy what is essentially a small gas-saving car for running errands and commuting -- that is, a high-convenience car -- you'd probably want that car to be cheap. GM would have to cut the Volt's price in half to make it a true high-convenience car -- one that could compete successfully against other high-convenience options, like a Smart car, a Toyota (TM) Prius, or a Honda (HMC) Fit. General Motors knows that's true. "Clearly, if we really want to have these vehicles get traction and want to bring the price of vehicles to a level that's competitive with, say, a hybrid today, we got to get battery costs way down from where they are today," GM vice president Jonathan Lauckner said at a conference this week. All in all, the Volt is not going to compete with gas cars on fidelity -- and it's not going to come close to matching gas cars on convenience. That will leave the Volt stuck right back where electric cars have been for the past nine decades -- in that fidelity/convenience no-man's-land of consumer apathy. No matter how much people like the idea of driving an electric car, most won't buy one unless it's a winner for them on either fidelity or convenience. The Volt is a nice try. But the way things look now, don't bet on it succeeding. Kevin Maney is the author of Trade-Off: Why Some Things Catch On, and Others Don't (Broadway Books, 2009).